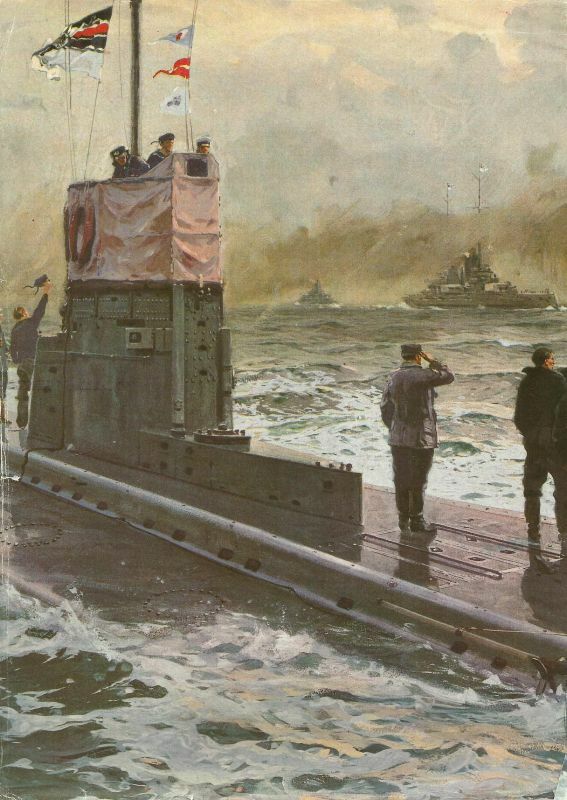 German U-boat greets running past battlecruisers. North Sea: Whole High Seas Fleet puts to sea (until August 19) for penultimate time until April 1918 with aim of shelling Sunderland and drawing British warships onto five lines of U-boats (24 in all); 8 Zeppelins scout. Royal Navy submarine E23 (one of 25 subs on patrol) puts 2 torpedoes into battleship Westfalen (one of 18 battleships and pre-dreadnoughts, together with 2 battlecruisers) forcing her back to port, but Scheer persists and Room 40 aided Jellicoe has sailed to meet him at 1700 hours, 5 hours before Scheer sorties. Battle of the Somme: British 33rd Division attack at High Wood fails (German counter-attack, also August 23 and 24), British advances towards Ginchy and Guillemont. Falkenhayn, Conrad and Enver sign convention for action against Rumania.